I know what you’re thinking. 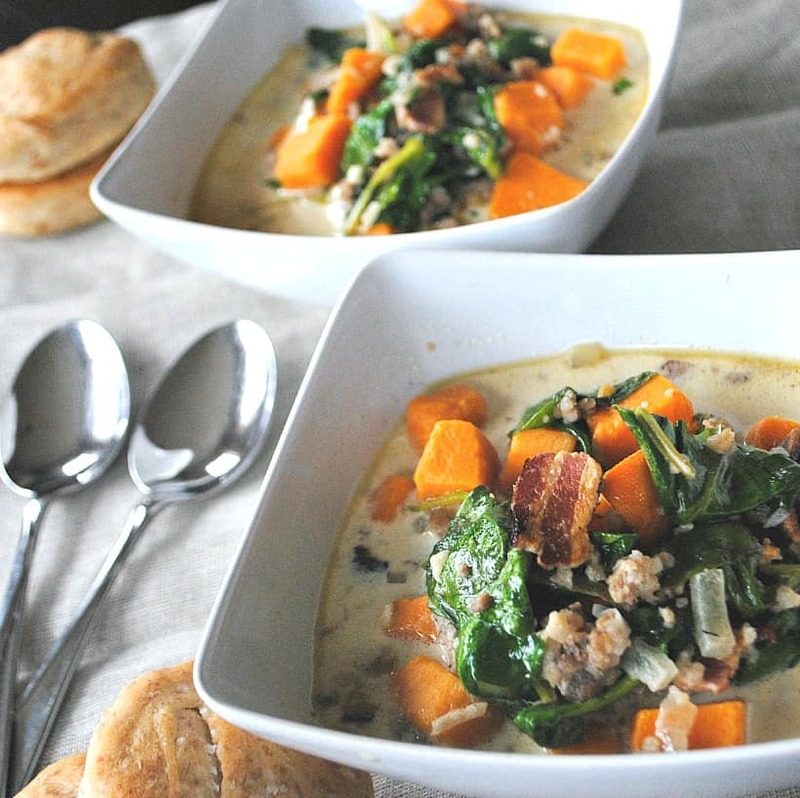 “That sounds like an odd group of ingredients for soup.” As I was adding ingredients to this dish, I had every intention of making something more along the lines of Zuppa Tuscana Soup… But it turns out I didn’t have the right ingredients. That said, this soup was amazing. It’s a healthy soup too! Aside from the fact that it has bacon and sausage. Oh, and heavy cream. It has spinach and sweet potatoes, which totally make up for the other stuff in my book! I served this soup with a fantastic rye bran roll, which I’ve included the recipe below as well. 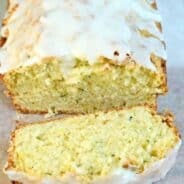 I know, two recipes in one post! No rye bran? 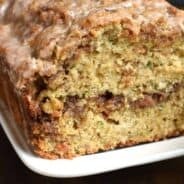 Go ahead and sub your favorite bran in this recipe, but be sure to try rye sometime, it’s amazing and healthy! In large soup pot cook bacon until desired consistency (I like ours to near crunchy). Add sausage and cook through. Drain all but 1 Tbsp grease. Remove meat. Add onion and garlic to soup pot with grease and cook for 2-3 minutes. Add bacon and sausage back in to pot. Add broth, sweet potatoes, salt and pepper. Bring to boil, then simmer on medium-low for about 20 minutes, making sure potatoes are cooked completely. Add spinach and cream and heat until warm. Serve with parmesan cheese. Enjoy! In large mixing bowl, mix together water, oil, 1/4 cup butter, honey, flour, bran, and yeast. Add in 2 tsp salt. Dough will be sticky. Cover and let rise about 30 minutes. Divide dough in half. On floured surface roll dough to about 1/4inch thick. You can use a pizza cutter (or dough cutter) and just cut squares, or use a biscuit cutter. Makes about 30 buns! 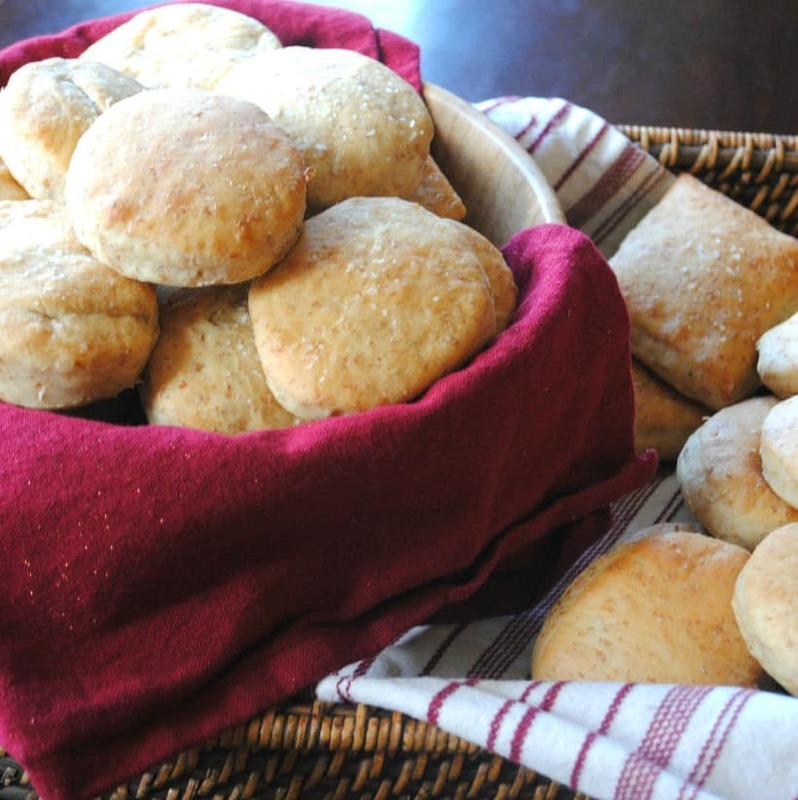 Bake rolls in a 400 degree oven for about 10 minutes. Immediately brush with remaining melted butter and sprinkle with remaining salt. Enjoy! **These are wonderful the next day if you split in half and toast. Spread with peanut butter and/or jelly. Also makes a great roll for sandwiches! Enjoy! Looks so yummy! and warm. I love sweet potatoes in soup! I have been experimenting a lot with vegetarian sausage, I bet I could sub it into this recipe! Thanks for sharing, as always looks delicious! 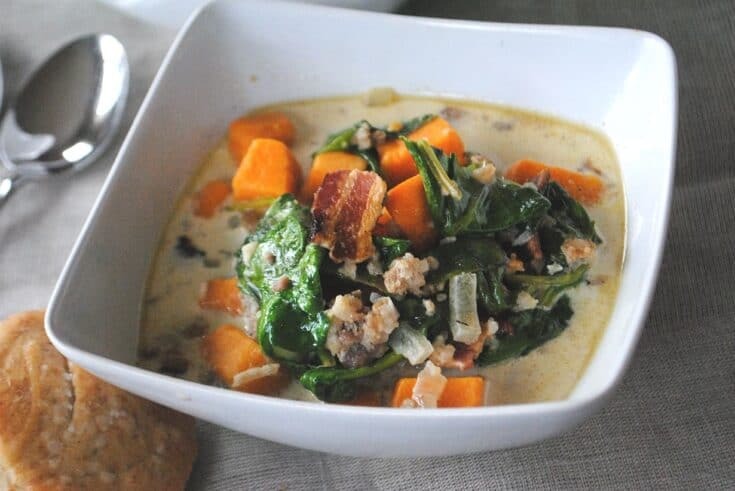 We had a sweet potato soup when we were in Haiti this fall and I have been wanting to try and recreate it. This sounds super yummy and perfect for a cold night!!! 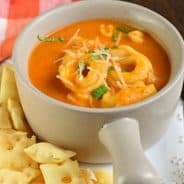 i love all of the flavors in this recipe! very creative. it looks like it would warm me right up. Both items look fantastic! 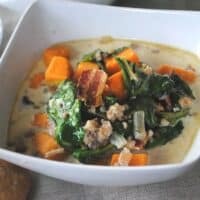 I have an utter weakness for sweet potato soup, what a perfect meal! I enjoy making soup so much. I hate it when the weather gets cold and I cannot justify making a pot. Thanks for sharing this recipe.